Alaska is a great big outdoors playground and we'll be experiencing part of it at the great Alyeska Resort. 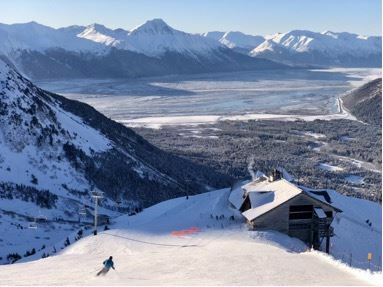 With an average annual snowfall of 669 inches, temperatures in the mid to high 20°'s and 1,610 skiable acres with 2500 vertical feet of diverse terrain and short lift lines, Alyeska Resort lives up to Alaska’s “steep and deep” reputation while offering a mountain experience for all levels of skiers. Intermediate and Advanced skiers will love the wide, open bowls, cliffs and chutes, and long top-to-bottom runs, while tree-lined groomed runs are ideal for the Novice. Chugach Powder Guides are also available to give us on-mountain tours or an amazing backcountry adventure! Our accommodation is the newly renovated, 4-Star Hotel Alyeska resort, surrounded by the majestic Chugach Mountain Range. Hotel Alyeska offers luxurious accommodations and convenient access into the Alaskan wilderness. The hotel features a 60-passenger aerial scenic tram, for direct access to skiing. Other Hotel amenities include Northern Lights wake-up call, heated towel bars, in-room refrigerators, free Wi-Fi, complimentary bottled water and private ski lockers with boot dryers. At the end of a long day of skiing you'll enjoy the Salt-water pool, whirlpool, sauna, fitness center, and signature spa, and then a good night sleep on their all new Serta Presidential Pillow-top mattresses. Optional activities include: Nordic Skiing, Heli-Skiing & Cat-Skiing, Snowmobile Tours, Dog Sledding, Northern Lights, Glacier, Bear, and Wildlife Viewing, Day Trips to the Wildlife Conservation Center, Portage Glacier, Whittier & Prince William Sound, and the Kenai Peninsula – so much to fit into one week!!! We’ll return to Anchorage on Friday to participate in the 'Fur Rondy'; the annual Fur Rendezvous Festival, of which the highlight is the ceremonial start of the famed Iditarod. Enjoy the hospitality of this great city with accommodations within walking distance of the festivities.